Aren’t we all on the lookout for a quality Bluetooth speaker? There are a million Bluetooth speakers available in the market to buy these days, of which three brands rise to the top of the heap: Bose, Ultimate Ears, and JBL. Among those only JBL makes models that also double as backup batteries for phones and other USB-powered devices: the Charge line. They are one of the few Bluetooth speakers out there that'll let you charge your device while playing music. JBL Charge 3 is the ultimate, high-powered portable Bluetooth speaker with powerful stereo sound and a power bank all in one package. JBL’s Charge 3 is a USB phone charger with a Bluetooth speaker built in. The JBL Charge 3 looks similar to the highly rated JBL Charge 2+ and has the same list price of $150 and £150. In Australia, the sticker price is AU$229, but you'll be able to pick one up for under AU$200. While the Charge 2+ is water resistant, its successor model is fully waterproof, with IPX7 certification, which means it can be completely submerged in water for a short period. Like its predecessors, you can lay it flat or stand it up vertically. And, for better or worse, the new model is about 20 percent larger and heavier. Listen wirelessly, Charge endlessly – that’s the motto of JBL Charge. The Charge 3 takes the party everywhere, poolside or in the rain, thanks to the waterproof design, durable fabric, and rugged housing. Its high-capacity 6,000mAh battery provides 20 hours of playtime and can charge your smartphones and tablets via its USB output. A built-in noise and echo-canceling speakerphone give you crystal clear calls with the press of a button. Wirelessly link multiple JBL Connect-enabled speakers to amplify the listening experience. The JBL Charge 3 has made its way onto the list of the best Bluetooth speakers thanks to its impressive battery life, great bass response and wealth of features. Recently, JBL has added the affordable Flip 4 to its lineup, but the Charge 3 is still king at the feature-packed end of the spectrum. Before we dive into the detailed review, let’s have a look at the comprehensive list of features the JBL Charger 3 has to offer. The Bluetooth - Wirelessly can connect up to 3 smartphones or tablets to the speaker and take turns playing powerful stereo sound. Built-in rechargeable Li-ion battery supports up to 20 hours of playtime and charges smartphones and tablets via USB. You can take crystal clear calls from your speaker with the touch of a button thanks to the noise and echo-canceling speakerphone. You can build your own ecosystem by connecting multiple JBL Connect enabled speakers together to amplify the listening experience. 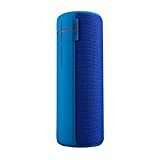 At 213 x 87 x 88.5mm and 1.76 lbs the JBL Charge 3 is about the size of a Thermos flask and covered in a tightly woven fabric, the Charge 3 is essentially cylindrical but for a flattened platform on the bottom that ensures it sits still. A row of buttons on top offer the usual array of controls: Bluetooth pairing, volume adjustment, and play/pause, which you can press twice in quick succession to skip a track, or hold to summon Siri or Android’s Google Assistant from your phone. In the middle, next to the power button, you’ll find one that looks like a cross between an hourglass and an infinity symbol. This is used to activate the JBL Connect feature, which allows you to connect other JBL-made products to form a symphony of speakers all playing the same tune from the same phone. Round the back, there’s a flap that covers the usual micro USB for charging, a 3.5mm input for the iPod Classic, and a full-size USB port. Now that covers the best of both worlds – old and new, doesn’t it? Let’s not forget the incredible 20 hours of battery life and waterproofing. The Charge 3’s whopper of a battery (6000mAh, twice the size of the one in the Samsung Galaxy S8) can be used to juice your phone. It’s not exactly a substitute for a pocket-sized charger, but it’s certainly handy to have the option. Of course, that’ll eat into its battery life, but with about 20 hours at your disposal, you don’t have to worry about running out of charge so quickly. The waterproofing is the big new feature for the Charge 3, and it's IPX7 rated, which means you can submerge the speaker in up to a meter of water for 30 minutes. But while it'll survive a dunk into the pool, it's probably best if you don't leave it there for an extended period of time. The JBL Charge 3 features dual external passive radiators that provide a visual element to your music playing—you'll see the radiators vibrate with bass-heavy tracks. Although exposed radiators are almost the equivalent of a two-meter exhaust port on the Death Star—a small, weak spot on an otherwise solid product – they are sufficiently strong to withstand pokes and have a rubber guard around them that allows you to prop up the Charge 3 vertically. The JBL Charge 3 is a big speaker, and that physical size translates to the big sound. These speakers can really crank and will have no problem filling a large room. Outside, they can project sound fairly far, but they're best experienced within about 20 ft. Isn’t that great? The quality and quantity of the bass offered by the speaker are impressive, though, high-frequency sounds tend to get chopped due to the waterproof construction of the speaker. But that is nothing to be concerned with considering all the wonderful features this charge friendly speaker has to offer. The Charge 3 also features a built-in mic so you can use it as a speakerphone for conference calls. You would find the mic quality clear and wouldn’t realize that you are speaking through a speaker. Now the question points to is it affordable? And how much value will the consumer actually receive compared to other speakers at the same price point? The JBL Charge 3 offers excellent sound for the price. At around $120 (£149.99, about AU$200), the Charge 3 is an excellent package for the money. You can buy your JBL Charge 3 from several marketplaces. WALMART MARKETPLACE offers Charge 3 for as low as around $98.97 while you can get yours at Amazon for a slightly higher but not exactly pricey value of around $120. The JBL Charge 3 is an improvement over the previous Charge 2 in just about every way. The Charge 2 may offer clearer highs, but the addition of waterproofing makes the minor sound quality sacrifice easier to swallow. It sounds better than UE’s Wonderboom, but it’s more expensive and isn’t as compact, while it’s cheaper than the UE Boom 2 but probably doesn’t sound quite as good and definitely isn’t as neat, which leaves you with a complicated three-way. This successor to the UE Boom ticks off every column that a Bluetooth Speaker should have. Features include portable, loud, waterproof and cost-effective. 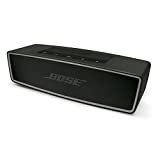 The Bose SoundLink Mini II is relatively ancient, having been released in June 2015, yet it remains one of the best sounding wireless speakers. That said, it punches way above what its size would suggest, producing deep bass, sparkling highs, and a lush midrange. While most wireless speakers sound OK, the Mini II proves that small speakers don’t need to compromise on sound and other Bose conveniences like a charging pad. The Soundcore Flare is an amazing value in the sub-$100 wireless speaker segment. Competitors like the UE Boom (listed above) give the Flare a run for its money in terms of build quality, but the Flare's sound quality is worth mentionable. The above comparison clearly shows why JBL Charge 3 is a better choice when compared to other brands available in the market for a similar price range and specifications. Charge 3 undoubtedly becomes your choice for a better price option featuring the best quality. There’s very little to criticize the Charge 3 for. Its robust design means it doesn’t really give off the impression of being a premium product, but on the whole, its audio performance would beg to differ. The addition of waterproofing makes it a Bluetooth speaker you can take just about anywhere. It's also nice knowing you can use the speaker as a power bank for your phone to keep the tunes playing. There is a concern that the passive radiators are fairly exposed and prone to damage. A screen covering these would prevent puncture, but the ability to "see" those things move with the music is an exciting feature. Of course, the market is filled with a zillion Bluetooth speakers, but there is something that makes Charge 3 unique. Adorning features like IPX waterproofing, Built-in mic, Bluetooth speaker, 20-hour battery life JBL Charge 3 is hard to resist in today's market. The not so high cost of this product compared to the rest available with its supreme quality makes it even more attractive to the crowd. 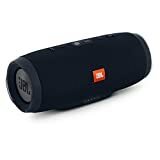 The JBL Charge 3 is a well-designed, fully waterproof portable Bluetooth speaker that features good battery life and doubles as an external charger for your portable devices. It also has built-in speakerphone capabilities and plays loudly with a strong bass for its size and price class. While it plays louder than the JBL Charge 2+, it doesn't sound as good. The JBL Charge 3 is larger than its predecessor, fully waterproof, and plays louder - but it should sound a little better. Based on this review we give a sparkling 4-star rating to JBL Charge 3. We can talk about the comparisons and the quality build JBL Charge 3 features all day long. But now it is time to pick one for yourself to see how this product suits your need. The JBL Charge 3 is a well-designed, fully waterproof portable Bluetooth speaker that features good battery life. It also has built-in speakerphone capabilities and plays loudly with a strong bass. However, it doesn't sound good as the JBL Charge 2+.